In the previous part, we’ve re-compiled Spectator View using the latest HoloToolkit sources. 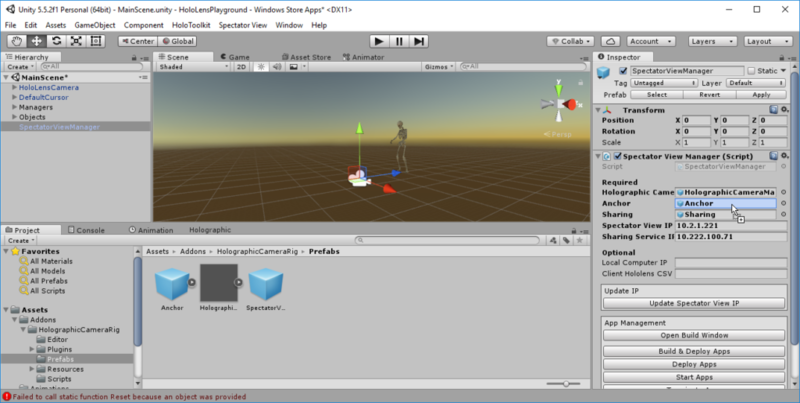 At the time of writing, this resulted in a compile error, as the HoloToolkit for Unity has seen a breaking change since Spectator View was released. In this part, we’ll first fix the Spectator View code, and then set it up correctly in our own Unity scene. Then, we’ll need to check several other things: how to launch the Sharing Service, adding Internet Connectivity and the Holographic Camera prefab. Turns out that the AddSurfaceObject() method from the base class SpatialMappingSource was changed. Instead of directly creating a Surface Object from a mesh, this process was now split up into two parts. There is one method to create the surface object, and another one to add it. I’ll probably create a pull request for that in the near future. That obviously includes moving the whole sample project to the latest HoloToolkit. This blog post series turned out a lot longer than I hoped it to be. Is it now finally time to test Spectator View with our custom app? Go to File > Build Settings. 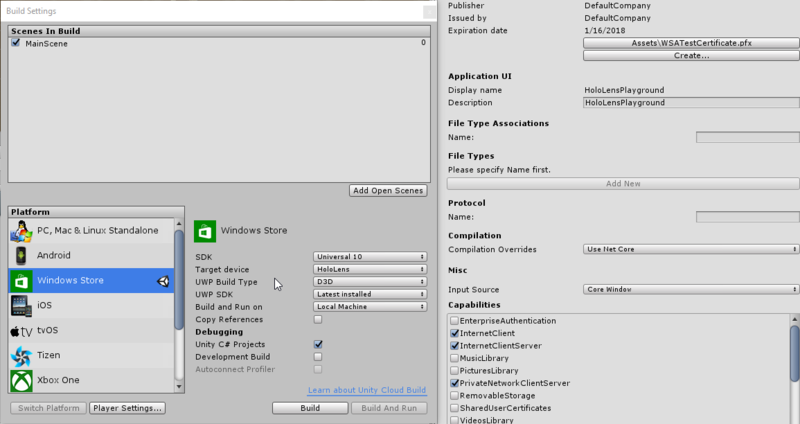 Make sure you have Windows Store selected (with the Unity symbol next to it, otherwise select “Switch Platform”). Next, select “Player Settings…” and in the inspector panel on the right scroll down to activate the InternetClient capability. When we launch our app on one of our HoloLens devices now, it already connects to the HoloLens SharingService server. Great news! Still not done, though. This is coming from the HolographicCameraRig\Scripts\SV_ImportExportAnchorManager.cs script. In the InitRoomApi() method, it wants to join a room. As there is no room yet, it would create a room – but only if a Holographic Camera is present. That camera is now actually the HoloLens that is mounted to our DSLR (identified via the IP that we’ve set for the SpectatorViewManager). So we have to really deploy the app to both HoloLenses in this step. That’s a bit more work, but you have to get used to that from now on. It’s a bit tricky to launch your app on the HoloLens mounted to the camera, as you can’t really see what it’s showing with the mount in front of the glasses. 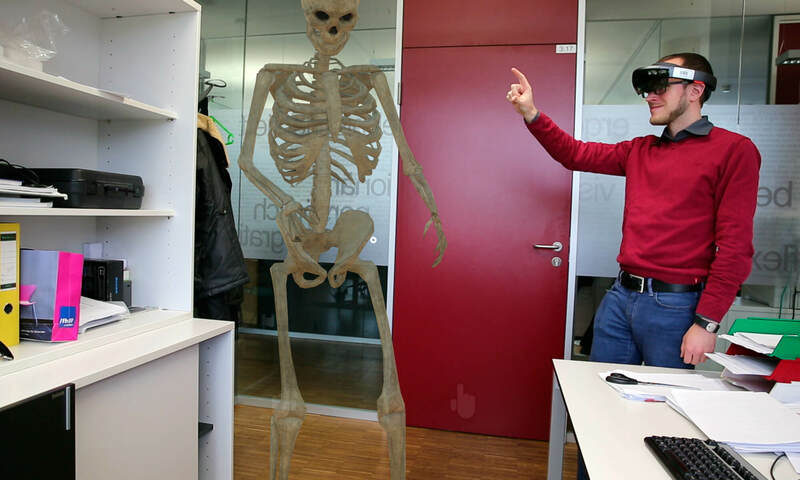 Therefore, I’ve usually deployed to the mounted HoloLens second, so that the app is launched through Visual Studio and I don’t need to manually interact. By the way, to switch the deployment target in Visual Studio to another HoloLens IP for remote deployment, go to Debug > [projectname] Properties … > Debug > Start options > Remote machine. 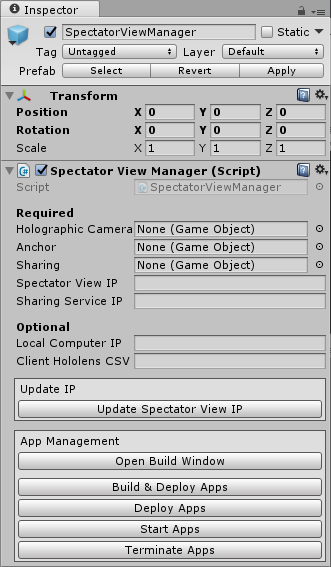 To see the Spectator View output, launch the compositor again in Unity through Spectator View > Compositor. The good news is that both HoloLens devies, as well as the PC with Unity now join the Sharing server. On the downside, the position of the hologram doesn’t get synchronized yet. How to extend our app for full Sharing support will be part of the next blog post!